Wizards designing core sets again is an exciting prospect for Modern players. This decision allows the company to print cards that answer problems in non-Standard constructed formats, or otherwise supply those formats with new toys, unfettered by the flavor restrictions a given world imposes. For Wizards’ part, they’ve seemingly jumped at this opportunity, for the first time aided by a perhaps-overlealous, but clearly Modern-aware, Play Design team. The yield? 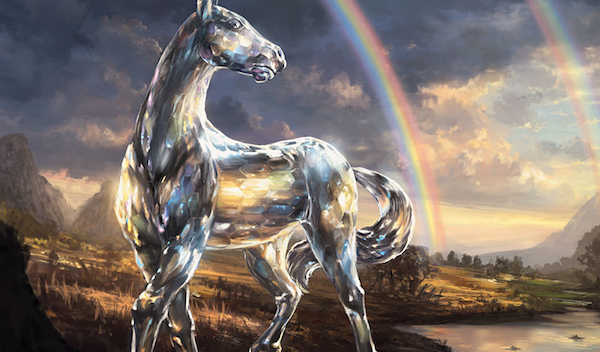 M19 is positively bursting with cards purposefully friendly to Modern, be they surgical answers to UrzaTron, handy role-players for established tribal strategies, or the all-purpose answers Modern has come to be known for. This article breaks down the smash hits, smash misses, and smash shrugs of M19 so far. Why save the best for last? The following cards are certain to see play in Modern. At once one of the most anticipated and controversial cards from M19, Alpine Moon gives Modern players something they’ve clamored for since Tron burst onto the competitive scene half a decade ago: a dedicated answer to big mana decks relying on specific lands. Tron lands check for type, not name, so Alpine Moon does indeed shut down the engine. Unlike Blood Moon, whose hefty converted mana cost and inherent deckbuilding restrictions severely restrict its potential homes, Alpine slots into just about any deck with red, offering pilots a Pithing Needle-style solution to whatever land they hate the most. For many decks, most notably Jund, that’s Urza’s Tower. But even Tron itself can play the card, and is most likely to board it in against Valakut decks and Inkmoth Nexus. Inkmoth just scratches the surface of Alpine’s utility. Against Jeskai, it plays double-duty by hitting either Celestial Colonnade or Azcanta, the Sunken Ruin; the same goes for Affinity, where it covers both Nexuses. Still, expect Urza lands and Valakut, the Molten Pinnacle to be the Modern cards most named by Alpine Moon. Wizards has long been weary of printing overly-efficient nonbasic land hate, but they did an admirable job with this card. Alpine Moon gets around many of the current design issues surrounding Blood Moon itself, like the fact that it is often used to colorscrew opponents. Alpine’s uses are limited to nerfing land abilities, and may even fix enemy colors from time to time. At one mana, the effect’s still a serious bargain, and this card is sure to see play in Modern for many years to come. Spell-worthy effects on limited-playable bodies frequently survive the journey from Standard to Modern, and Militia Bugler is no different. Rather than return a card from the graveyard like Eternal Witness, Bugler digs deeper into the deck, scouring the top four cards for a utility creature with the right text box for a given situation. Choice hits that spring to mind include Thalia, Guardian of Thraben, Meddling Mage, Thalia’s Lieutenant, and Phantasmal Image. Oh, and one more thing: Bugler’s a Human! Humans is already strapped for space, and has resorted to cutting Thalia herself to accommodate more utility options. But consistency of this quality tends to find its way into competitive decks—after all, if a card digs deep enough, it essentially provides players with additional copies of those they would have included anyway… not to mention improves valuable sideboard slots like Kataki, War’s Wage. I’d be surprised if Bugler didn’t surface in Humans at some number. And who knows? It may even buff other creature strategies like Death & Taxes or Counters Company. Users of the spoiler sites I follow were quick to write this one off. True, Sarkhan, Fireblood‘s second ability only works for decks with Dragons, and very few Dragons are actually Modern playable (just Thundermaw Hellkite, Stormbreath Dragon, and Glorybringer, each run in small quantities and as flex spots topping out the curve in their respective homes). But his other two are great! Red-heavy decks love consistency. Take a look at the cards they run: Blood Moon, Ensnaring Bridge, Skred… against some opponents, and on certain board states, these high-impact cards can just be dead. I’ve even employed Faithless Looting in my own Blood Moon decks to sift past redundant pieces, and have long sworn I’d play more than four copies if allowed. It seems that opportunity has arrived, and on a critical point in the curve, no less. Sarkhan comes down as early as turn two off a mana dork and immediately starts filtering draws. What’s more, his ultimate is nothing to scoff at—it’s a win condition of its own. Creeping toward that ultimate, which provides a unique angle of attack for many red decks, forces opponents to deal with the rummaging engine and makes them play into removal and other tricks. I imagine we’ll see Sarkhan, Fireblood in a variety of red decks, but especially ones with cards to spare. There, he’s a cheaper Karn, Scion of Urza with more upside in the long run. And after a couple days of testing, I can confirm that cascading into Sarkhan with Bloodbraid Elf is just as juicy as it sounds. I’ve divided this section into two parts: cards that will need to prove themselves, and cards that will need certain conditions to be met before they can start proving themselves. These cards merit testing immediately, and will probably appear in some number in the 5-0s once M19 becomes legal online. But a small-scale result or two doesn’t mean they’re here to stay. Isolate: Noble Hierarch? Goblin Guide? Death’s Shadow? Fatal Push already killed those. Aether Vial? Alpine Moon? Lantern of Insight? Now we’re talking. The latter can’t even be saved by Welding Jar in response. Clearly, Isolate has plenty of targets in Modern, but I wonder if it’s not too narrow for widespread adoption. We might see Jeskai try out a copy in the mainboard. The spell almost definitely doesn’t do enough for the side. Mistcaller; Remorseful Cleric: A twofer! These creatures automatically slot into their respective tribal archetypes, Merfolk and Spirits… or do they? Spirits may just not care about any graveyard-related thing people are doing, especially since it has access to Rest in Peace already. But the incidental mainboard hate can’t hurt. As for Mistcaller, this creature represents a huge step down from Containment Priest in terms of power level. Aether Vial users can even choose not to put a creature down after Caller’s been sacrificed. But as Merfolk becomes more Death & Taxes-like in its employment of disruptive creatures, I wonder if there isn’t a metagame for Mistcaller after all. My gut says if Cursecatcher no longer cuts it, neither does this. Infernal Reckoning: This spell isn’t the godsend against Eldrazi that Grixis players might have hoped for—Ceremonious Rejection, which also hits the increasingly relevant Krark-Clan Ironworks, handily trumps it there. But Reckoning does have its uses, chief among them providing Jund with a clean out to Wurmcoil Engine, otherwise a game-ender if not a massive resource swing. Unfortunately, this card has few other uses, and is further limited in application for Death’s Shadow decks thanks to the lifegain clause. Runic Armasaur: 2/5? Talk about body! Armasaur survives not just Lightning Bolt, but Chandra, Torch of Defiance; it walls Thought-Knot Seer and all but the meanest Tarmogoyfs. It’s the creature’s ability I’m worried about, especially relative to Armasaur’s cost. 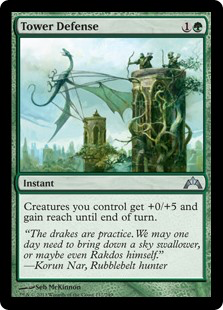 At this price point, the Dinosaur competes with Courser of Kruphix and Tracker">Tireless Tracker, although both of those are functional four-drops when it comes to card advantage. Armasaur’s plenty conditional too, though, requiring opponents to activate abilities before pilots draw their cards. 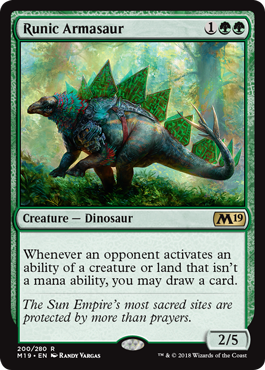 It helps that the Dinosaur is triggered by fetchland activations, and is likely to make Affinity players think twice about tapping Steel Overseer, let alone going all-in on a Ravager attack. This kind of combo play is what Armasaur excels at stopping—Devoted Druid, you too. Such activation-heavy plays give players a window to draw into removal and disrupt out the combo. At three mana, though, I’m still not very excited about this creature. I think it will mostly deter opponents from activating their abilities, serving as a soft hate piece. After all, opponents reserve the choice to play through Armasaur if they want, so beware of tapping out. These cards lack an ideal home in Modern, but have potential for greatness should a proper shell emerge. Thud: A two-mana effect on an instant shifted to a one-mana effect on a sorcery. I can’t argue with the principle’s elegance, but Temur Battle Rage has brutally power-crept this sort of Fling effect already. Stitcher’s Supplier: Quite a bit of self-mill for one mana. Supplier outdoes Thought Scour only in decks that prefer the body to a card, which at the moment are few and far between. Dredge will probably favor Shriekhorn. Elvish Rejuvenator: Ancient Stirrings on a body, kind of—it only finds lands, but then it puts one into play. Counting the legs, that’s a pretty decent rate for three mana. But I don’t know what deck would want this card. Valakut decks just want any land, making Wood Elves a more reliable three-mana ramper. Rejuvenator would be sweet in something like Dark Depths, were it legal. The upside is high with this one. Amulet of Safekeeping: Here’s where Wizards’ drive to create multi-purpose Modern sideboard cards spiraled out of control. Amulet mashes two mostly unrelated effects together into one weird-looking trinket. Sure, they combine to stop Storm’s win conditions, but don’t de-sleeve those Damping Spheres just yet—Storm can just go off, find Repeal, and then kill you, while Sphere prevents them from doing even that. And Amulet marginally slows down Burn, but the token clause does nothing there. For Amulet to become a sideboard staple, Modern will need top-performing decks to care more about its effects; right now, they just don’t. None of these cards will see play in Modern, mostly as a function of their middling toughness. Goreclaw, Terror of Qal Sisma: The latest in a long lineage of cards that get people excited about trying to cast Myr Superion in Modern, Goreclaw features an exciting build-around on an aggressive body. But that body also has three toughness. And Bant Eldrazi doesn’t want this anyway; it’s already emptied its hand by then, and has evasion redundancy with Smasher, Drowner, and Displacer. Isareth the Awakener; Resplendent Angel: Pushed effects on overpriced 3/3 frames. The former’s a harder-to-cast Alesha without first strike; the latter, a build-around Angel factory. These cards are very unlikely to do anything in Modern. Doran, the Siege Tower decks have existed since Modern’s humble beginnings. Existed, not succeeded; revolving around their namesake card, the decks were crippled by needing Treefolk Harbinger to reliably take advantage of Doran’s text box. Assault Formation slightly alleviated this problem by granting the deck some redundancy, but the enchantment’s uselessness in multiples forced pilots to continue running Harbinger or suffer from the occasional do-nothing draw. Another option was to tune the deck to play more like Abzan Midrange, relying on Doran synergies as an afterthought. Arcades, the Strategist gives the deck another Doran effect attached to an imposing body. It allows pilots to do away with Harbinger once and for all and benefit from pulling out of the Abzan boat with hateful sideboard cards like Rest in Peace. This deck is obviously quite rough around the edges, but it has some promising dimensions. Arcades lets us run actual defenders, the best of which is Wall of Omens. And the blue splash enables Sidisi’s Faithful, a utility bomb in this deck that sets up alpha strikes, disrupts creature plays, and swings for four most of the time. The supremely versatile Lingering Souls is all that’s left of the backup Abzan plan. Without Goyfs and Knights to nurture, Ensnaring Bridge becomes an option out of the sideboard, as does Rest in Peace. Another interesting spell is Tower Defense, which at first glance is crazy with Souls and Doran, but upon further inspection has more to it. Defense reads a lot like Temur Battle Rage, enabling wild comebacks or quick wins and forcing terrible blocks. Even with a couple of 0/5s in play, the instant can often present lethal out of nowhere, a threat we may want to take advantage of in the mainboard. As of this writing, just under 50 cards remain to be spoiled. I’m not as excited by the prospect of looking over the final commons as I am by the deliberate efforts Wizards made in M19 to support Modern. Their earnestness offsets ham-handed designs like Amulet’s, and the direction they’ve moved towards with simpler ports of lowering the mana cost by slightly altering the spell is right up my alley. Which M19 cards have you the most excited? It also seems to me like nyx fleece ram would be far less important than wall of omens. Is lifegain really important when you can pretty safely block just about anything forever? It’s more that 5’s a lot bigger than 4. But apparently I misread the new Doran and it only gives the toughness flip to actual defenders, so the concept definitely needs an overhaul! Damn I didn’t notice that. Makes it a little tricky. Some other cards worth mentioning: suncleanser out of taxes and humans, detection tower for bogles tech as a meta dependent possibility. Spit flame could make some moon stompy decks and skred get a bit better. Amulet looks more like an absurdly specific Rending Volley for storm. One ability hits Grapeshot and the other hits Empty the Warrens. I came here to mention supreme phantom. As a spirit player this is likely the best thing to happen for the deck since eldritch moon, because it fills the last 2 drop slot the deck was missing, and also makes the deck much more aggressive. I’m very excited to play with it. Also the little gy hate spirit cleric will be quite good in the sideboard since it leaves our own graveyard intact for moorland haunt. Benefitting from the tribal synergy, like being able to flash it, or just beating face until we really need to crack it, makes this a big improvement over RIP, i think. Agree about Phantom. After giving it more thought, the Cleric will probably see play outside of Spirits, too—it’s an elegant Chord target for the toolbox decks, for instance. I think amulet will have its place in the format for certain decks in certain metas. It disables twin, kiki, felidar combos as well as nerfing lingering souls and young pyromancer. Amulet is also an interesting tax on a bunch of effects from gifts ungiven to Liliana minus two to Boros charm to blessed alliance. You won’t generally want both effects for the same match but maybe the combination covers off enough matches to earn it a spot.